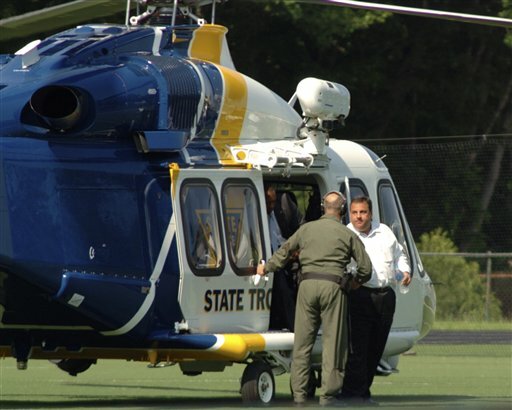 Trenton, NJ - New Jersey State Police officials say it costs $2,500 an hour to fly in their helicopter, but that ferrying Gov. 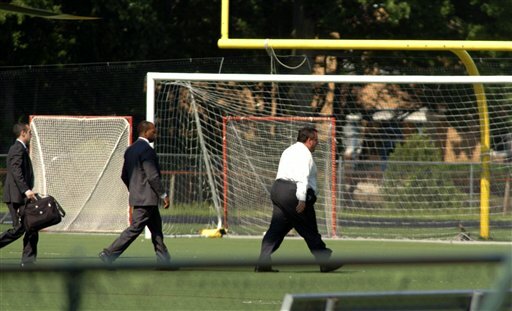 Chris Christie to his son’s high school baseball game didn’t cost taxpayers anything extra. In a statement, State Police Superintendent Rick Fuentes says Christie has been aboard state police helicopters 35 times since taking office. Fuentes didn’t say which, if any, of the trips were personal or political in nature and whether the governor has ever reimbursed the state for taking the trips. After the game, Christie had a dinner at the governor’s mansion in Princeton with a delegation of campaign donors from Iowa who tried to convince him to run for president. A Christie spokesman says the helicopter is used occasionally “as the schedule demands” but says the governor has been judicious in its use. Why does he need such a big helicopter for? Buy him a cheap bubble cockpit helicopter. Christie: 35 Helicopter Rides, some on Official Business. “ Why does he need such a big helicopter for? How could flying him by helicopter to his son's baseball game not cost anything "extra". It doesn't cost $2500/hour to drive him in a limo. Also, all the extra fuel to fly this svelte governor also adds up. He should set an example and bike to his appointments. He needs the exercise and he could save the state tens of thousands of dollars. notice there is no talk of Obama taking 500 of his friends to the UK, or about Weiner's wiener, the media only goes after Republicans. And give Obama a Piper Cherokee for all the flying around he does on our dime!